Jonathan Holmes outline of Threshold Learning Outcomes for Creative Arts Graduates. 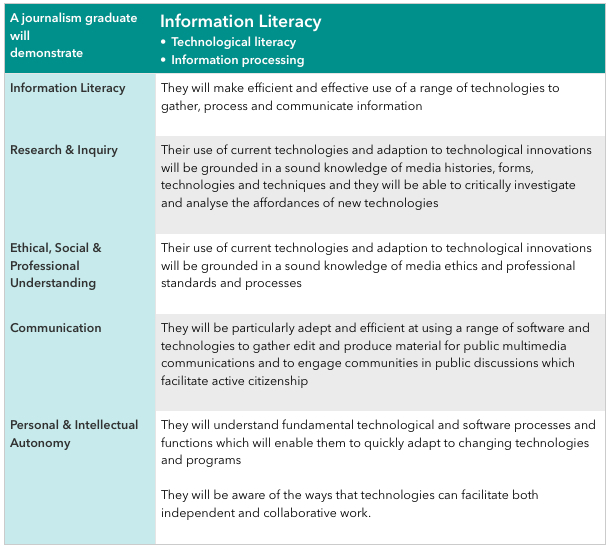 So in the first table below the learning outcomes or capacity statements all relate to information literacy (which in the Barrie GAP framework refers to both technological literacies and information processing capacities). 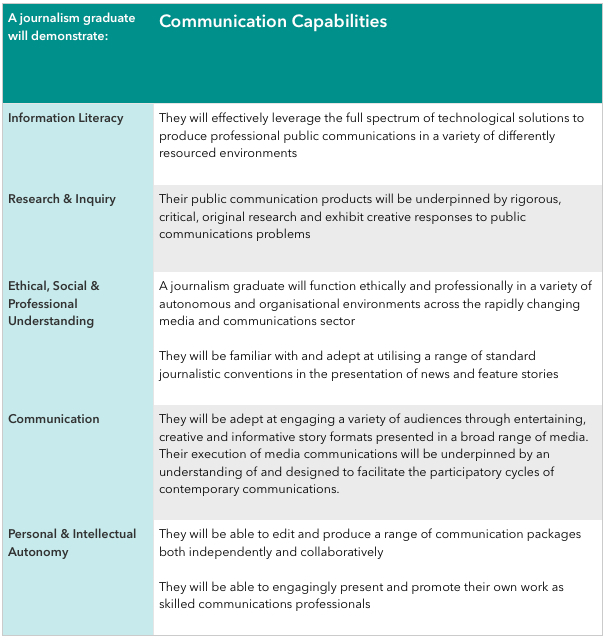 The first cell is the key statement about information literacy, the second cell articulates capacity at the intersection of information literacy and research literacy, the third cell looks to the intersection of information literacy and ethics etc. When the pairings come up again a further aspect of this skill set is examined for example in the next table the first cell again pairs information literacy with research capacity. 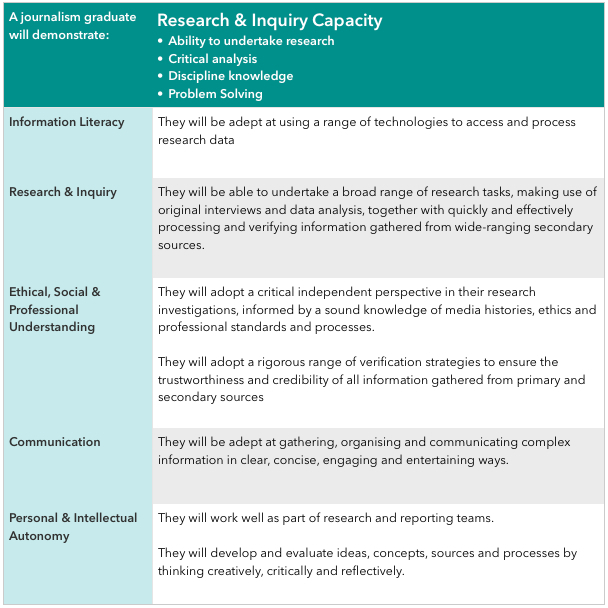 While in the first table the emphasis is on how does research capacity enable information literacy in the second table the question is reversed: how does information literacy enhance research capacity. 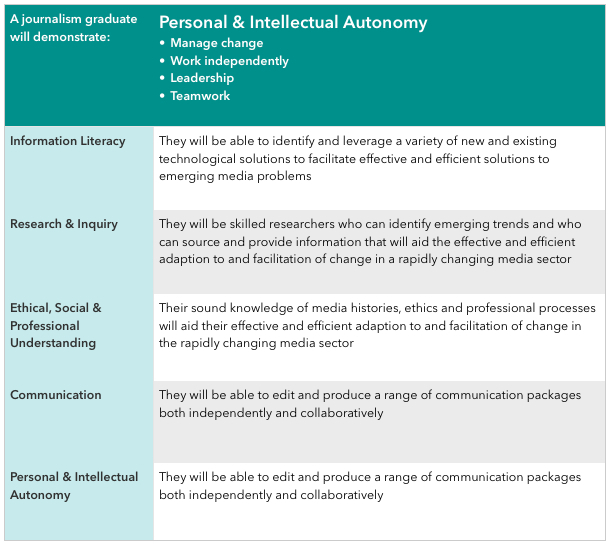 Thinking through fundamental graduate capabilities in this way allows a rich picture of an adaptable multi-literate professional with interdisciplinary skills. 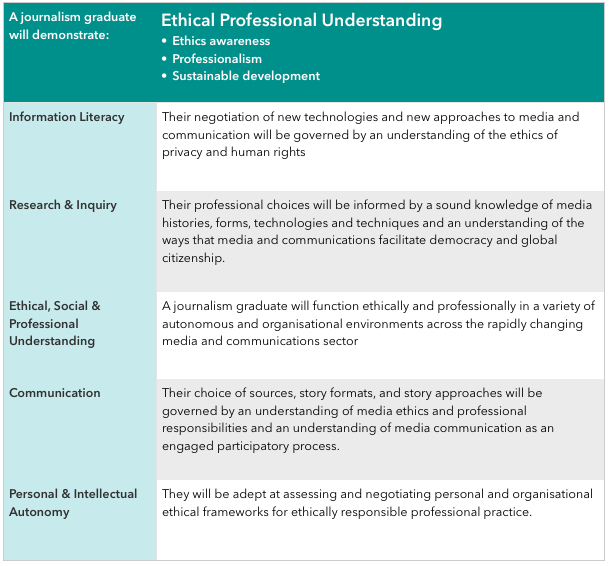 This is important for any contemporary graduate but is particularly important for a journalism graduate in the fast changing media and creative industries. "The biggest problem is that while journalism programs produce excellent graduates for existing business models, very few of those same graduates have been encouraged to envision new business models or how to change journalism to enhance sustainability and improvements for the future. So they become disappointed if the number of available ‘old fashioned jobs’ is reducing, but have not been empowered to do anything about it, such as take an entrepreneurial or experimental approach." "A communications degree with a journalism major is the new equivalent of a generic arts degree. It produces graduates qualified to be professional communicators in any field, including corporate communications, government work and entrepreneurial new media. It also produces graduates who are savvy consumers of media and are able to function as discerning citizens able to take part in democratic processes like public debates and elections." "My impression is that the older programs have had trouble innovating fast enough. There’s no industry that’s changing faster than journalism and the difficulties of turning around a very large existing program, with all the staff and curriculum and the university bureaucratic processes involved, are considerable. I think I’ve been lucky in that I’ve twice now had the job of basically starting a program from the ground up, and being able to think freshly each time, what will our graduates need when they graduate in 2-3 years time which is different from what they need now and certainly different from what they needed 3 years or five years ago." Journalism education is not the same as the cadet training program in a major news organization. It’s an undergraduate degree, and 50% of students four years after graduation, no matter what degree they’re doing – medicine, law, engineering – will be doing something totally different from what they have trained for, so in the university context journalism is both straddling a professional outcome, where effectively major news organizations have outsourced their training to universities, but on the other hand universities are educating people for a broader range of life, skills, opportunities and general education. How do you achieve a balance? It will depend very much on the individuals involved. Someone can teach practical skills while at the same time present them in a theoretical context, while another might present them merely as techniques. Theory and practice work together all the time: any attempt to try to separate them or to establish an ideal mix is destined to fail because of the individual variable involved. The test might be that a graduate is able to apply a wide range of technical and practical skills within a critical framework which reminds them of the implications of their practice. If we don’t do that then we are simply training practitioners.